Parameter displayed : Active Energy(Wh), Pf, Active Power(kW), Voltage(Line to Line & Line to Neutral), Current, Frequency. 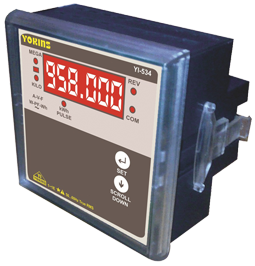 - Microcontroller based meters with low VA burden. - 6 digit seven segment display. - CT primary range 1A to 50kA AC programmable. - CT Secondary range 0.5A to 5A - AC programmable. - PT primary range 50V to 500kV AC programmable. - PT Secondary 50V to 500V AC programmable. - True RMS measurement of parameters. - Auto scaling of parameter values. - Auto/Manual scrolling of parameters. - Three switches for easy onsite programming. - Touch proof voltage & current terminals. - Compact size and light weight. - ABS dust-proof rugged casing. - Load hour for secondary source(DG) are displayed in dual energy meter. - Smart Voltage sensing(AC & DC)of secondary source in dual energy meter. - Watt Hour displayed with Kilo and Mega indication. Auxiliary Supply : Universal Auxiliary(90-300V AC) Supply (Other supply voltages on demand). Accuracy : Class 1.0 or Class 0.5. Inputs : Voltage (upto 500V) Current Secondary(5A). Panel Cutout : 92mm x 92mm. Standards for enclosure : IP-20(Back), IP-65(Front). - RS-485 standard, communication capability using modbus RTU protocol.